Wrinkle relaxing, or Botox* injections are undoubtedly the most famous cosmetic dermatology treatment due to their effectiveness, low cost and rapid results. Clinical muscle-relaxing injections have been used for therapeutic purposes since the 1960s and for cosmetic purposes since the mid 1990s. Today, wrinkle relaxing injections are the most widely used medical aesthetic treatment with the equivalent of 1 in 100 people having the treatment each year in the USA. 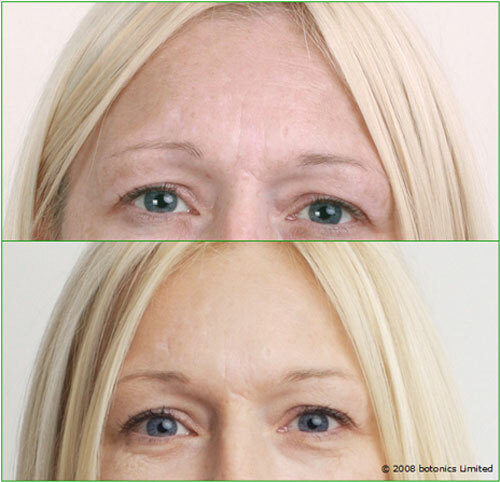 The treatment temporarily reduces lines around and between the eyes, on the forehead and around the mouth by relaxing the underlying muscles creating a smoother, more youthful look. The ideal result smoothes creases but leaves natural expression. With all cosmetic dermatology, there are many options to consider and for our faces and wrinkles there is the option of Botox*. This is probably the most common treatment to receive if you are unhappy with fine lines and wrinkles in your face and with the results shown, Botox* is the most widely used treatment. If your desire is to have a more youthful look, Botox* injections are something you want to be looking into. The results last about 3 – 4 months or longer with regular treatment. All treatments will be fully explained before you commit to anything and our specialists will ensure you are fully comfortable prior to treatment.